After the renal hilum dissection has been completed, the kidney is sequentially mobilized using blunt and sharp dissection. Dissection is initiated at the upper pole. 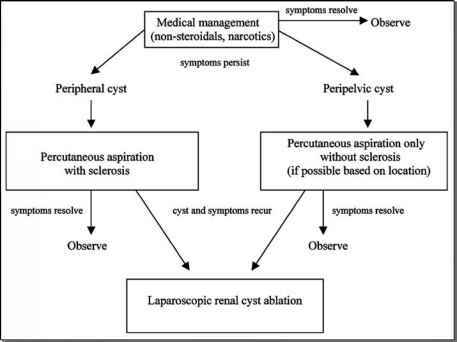 The surgeon will then need to decide whether the adrenal will be spared or removed en bloc with the kidney. While established oncologic principles need to be adhered to, it is often easier to remove the left adrenal en bloc with the kidney because of the adrenal vein drainage into the already divided renal vein. On the right side, additional dissection is required to expose and allow ligation and division of the right adrenal vein as it enters the inferior vena cava. Regardless, meticulous hemostasis with electrocautery is advisable. Inferiorly, the mobilization is performed with cautery and blunt dissection along the psoas muscle. The dissection is taken up to the diaphragm. Separating the anterior aspect of Gerota's fascia from the peritoneum without creating a hole in the peritoneum requires care and meticulous dissection. An incidental peritoneotomy will greatly increase the difficulty of further dissection because the hole allows normalization of the pressure gradient between the peritoneum and the retroperitoneum. As a consequence, the surgically created working space in the retroperitoneum will collapse. The 10-mm fan retractor is a useful instrument to facilitate blunt dissection and mobilization. Once the upper pole is mobilized, attention is turned to the inferior pole. The ureter is easily identified on the psoas muscle. The ureter is mobilized and clipped superiorly and inferiorly and then divided. The gonadal vein is seen with the ureter and is doubly clipped and ligated. The lower pole mobilization is then completed using the psoas muscle as the margin of mobilization. Dissection proceeds until the kidney is completely mobilized.